After that, Stadter decided try the Palossand gimmick using Pokemon Sun & Moon’s new QR “rental” feature, which allows you to temporarily adopt new teams. That’s when a meme was born. Stadter’s Palossand team ended up including Smeargle, Tapu Koko, Gigalith, Porygon Z, and Celesteela, a roster that allowed him to win a local tournament. In casual play, the team was affectionately named “Sandcastles in the Sand,” after the Robin Sparkles hit single in How I Met Your Mother. Stadter even played the song as he destroyed people online. Wanting to share the love with everyone, Stadter published all of the team’s details on his Twitter. With the gates to hell’s beach thrown open, anyone can use the team. To understand how the main strategy works, there’s no better way than watching the master himself. In this game from his stream, Stadter perfectly demonstrates how to execute the core strategy. On turn one, Stadter leads with the team’s core duo, Smeargle and Palossand. His first priority is to buy a turn of safety for Palossand to boost its special defense with the move Amnesia. To stop a potentially devastating Z-attack, Stadter uses Fake Out and flinches the Salamence. The next turn is where things get really devious. Smeargle starts the turn off by attacking its partner with Water Shuriken. This move, which has priority over most attacks and can hit anywhere from two to five times, is exclusive to Greninja. However, Smeargle is able to learn any move from any Pokemon, making it one of the most common Pokémon on any gimmick team. As for why Smeargle attacks its own partner, the goal is to activate Palossand’s Water Compaction ability as much as possible in a single turn. 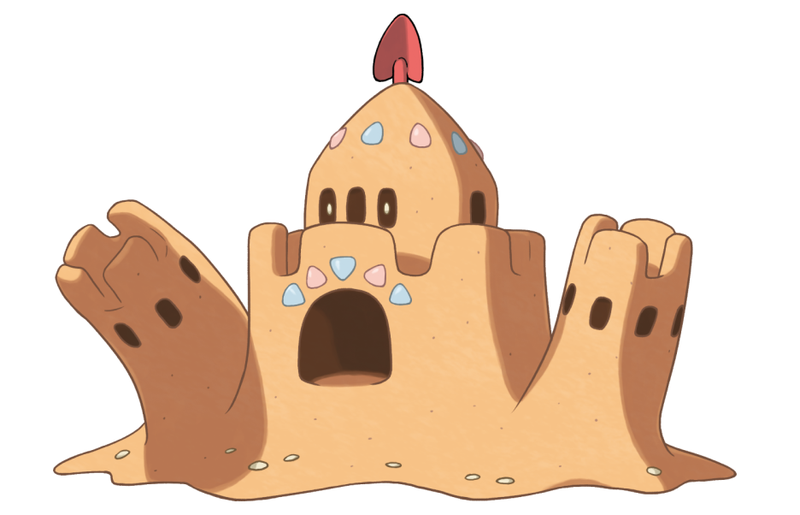 Like an actual sandcastle, the right amount of water can make Palossand’s walls sturdier, and its ability boosts its attack twice every time it is hit by a water attack. The normal drawback is that Palossand is weak to water and can’t normally survive super effective water attacks with much HP. Smeargle, however, has pitifully low offensive stats, so it can activate the boosts without doing much damage. Then, with maxed out defenses, even the strongest attacks won’t do much damage. The trick doesn’t end there, though. Before Palossand can get its second defense boost, its Weakness Policy item activates. This item doubles the special attack and attack of the user when hit by a super effective move. And, as we’ve already discussed, Water Shuriken accomplishes that as well. It’s the perfect way to kill two birds with one stone. Palossand became a semi-regular sight. So, by turn two, Palossand adds six defense boosts, two attack boosts and two special attack boosts to the two special defense boosts it got on turn one. He’s then free to almost knock out the Salamence with a souped up Shadow Ball. Smeargle simply uses Follow Me on turn three to redirect any attacks away from Palossand, which simply keeps attacking. In no time at all, the entire team is swept away by the sandcastle. The team is capable of employing other tricks too. For one, Tapu Koko can use Psych up to copy Palossand’s stat boosts and be just as threatening. Then there’s the Trick Room mode, where PorygonZ and Smeargle work together to reverse the turn order. From there, Gigalith comes in with its powerful rock type attacks while PorygonZ uses one of the strongest Breakneck Blitz attacks in the game. Celesteela rounds out that version since it’s capable of handling whatever Gigalith and PorygonZ can’t. As a result, the larger Video Game Championship community took to the team rather fast. With access to all of the team’s details, Palossand became a semi-regular sight on both the official Battle Spot ladder and on simulators such as Pokémon Showdown. Some players have even tried to use it in other unofficial forms of competition. Jamie Boyt, an accomplished player from the UK, used a version of Stadter’s team in a best of three match against U.S. player and Dallas Regional finalist Collin Heier. The two were participating in the first week of the National Pokémon Association, an annually run league where drafted teams of VGC players from around the world duke it out for a number of weeks. Boyt, however, wasn’t able to find the same success Stadter had when he used it. Don’t expect to become world champion using this team, but you can always imagine an opponent’s rage when a Palossand blows them away. Stadter, himself, stresses that the team is great because it’s enjoyable to use.